Yesterday, I had such a wonderful day at the Chelsea Flower Show in London and took a lot of photos and notes! Over the coming days, I’ll be sharing my visit with you on my blog. In the meantime, today’s post is all about stocks, which were very popular at Chelsea, both in the show gardens and the floristry demonstrations. 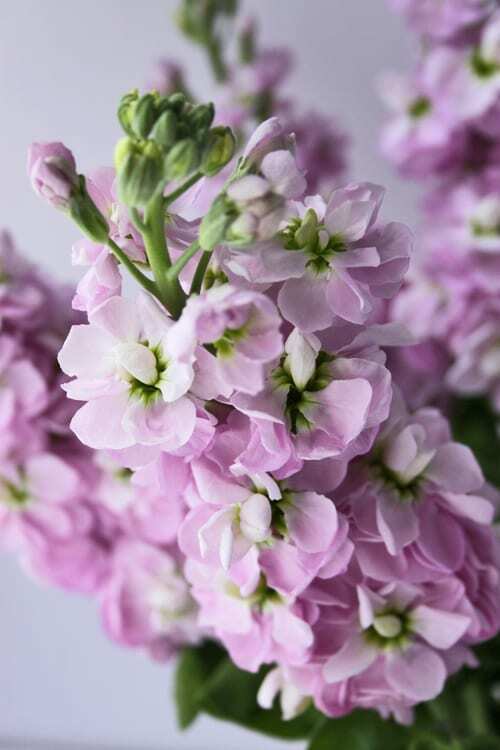 I remember the first time I came across them was when I was working for a florist in London and one of the freelance florists was saying how much she loved the amazing fragrance that they have. She described it as clove-like…and they really do smell like this spice. As a plant, they’re very popular in cottage gardens and have been grown since Victorian times. Clusters of round double flowers forming a spike at the top of each stem. They’re generally available in white, pink, purple, yellow and red. Their peak season is from March to August. Remove all the foliage below the water level. Cut the stems on a slant with scissors and place them in a clean vase with fresh water and flower food. 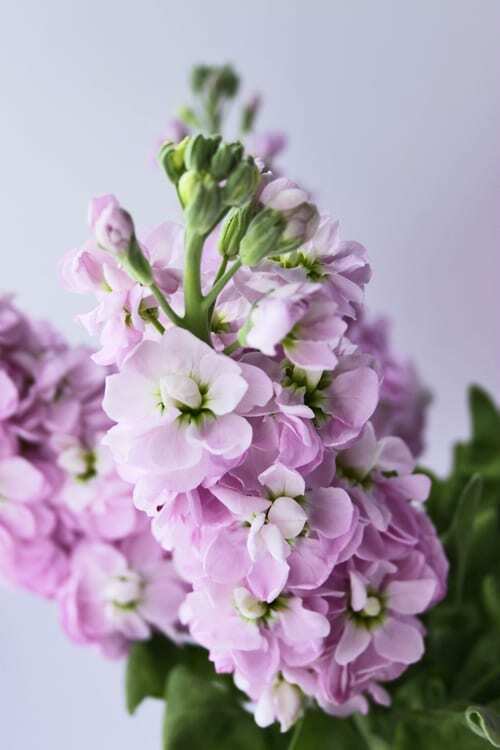 These sweet-scented flowers are named after Italian botanist Pietro Andrea Mattioli. They’re related to the cabbage family and are also known as gillyflower. Stocks represent lasting beauty and symbolise a happy life. So do treat yourself to some stocks….they really are an inexpensive and great way to bring a natural fragrance to any room in your home. Hi Fiona. That’s wonderful to hear that they’re just starting to flower 🙂 I love their heady fragrance, so I’ll put them on my list of plants to grow next year! I moved to Illinois from California…..I cannot find Stocks anywhere here – people think i am crazy – they have never heard of them……..
I’ll put a tweet on Twitter and see if anyone can help :-). Where can i purchase the beautiful fragrant flowers? I planted stocks in a flower pot, and waited patiently for the flowers to appear. I’m still waiting…..could I have gotten a batch of seeds that were unable to produce flowers? I gave them lots of sun and water. I would appreciate any advice. Should I bring them inside during the winter, and will they ever produce a flower? I had such a difficult time finding the seeds, to begin with, and I am so disappointed. Hi Barbara. I’m really sorry but I’ve never tried to grow stocks from seed before. I’ve simply bought them as cut flowers :-). Can I suggest that you visit your local garden centre and ask if they have any advice? I grew my stocks from seed. Easy peasy. They took two seasons to flower so be patient. I just bought stock flowers at walmart. They are so pretty and smell so good. Less than $2 for a blooming 3 inch pot full. This is the first time I have seen these plants at walmart. Actually, first time seeing these plants anywhere. They look like they are enjoying the springtime here, just hope they survive oklahoma’s 120 degree summer. I am trying to grow them in my cottage garden for second year now. I have grown them from seed and have just planted them out as they had reached height suggested for planting into garden. Can anybody tell me if they will flower in first year?Last years seedlings died off due to hard frost we had at an unusual time of year. Garden centers in UK do not seem to sell them,I have only ever seen them in florists as cut flowers. I am really hoping they will flower first year!I see them in other gardens and get frustrated that my garden will never look just the way I want it without these in it! I also have the same problem with Hollyhocks of which I also think are beautiful but apparently they take two years to flower,mine are on second year now so fingers crossed!